In most scenarios, we would do all we could to steer bees in the opposite direction. However if your goal is to grow a beautiful and productive vegetable garden, you’ll want to bring on the bees. Knowing how to attract bees is essential to the growth of a healthy and productive vegetable garden. Bees play a major role by pollinating the plants. Depending on your demographics, bees are not always in season. The presence of bees in any garden is essential to producing beautiful clusters of delicious vegetables. Shelter provision along with a colorful floral bouquet are among the many steps in how to attract bees. Providing an environment that is conducive to bee life is also an added benefit to them. Bees face hardships in finding safe habitats and are starting to decrease in population due to this. Planting flowers in abundance and plants that are native to your area are a major part of producing a bee inviting habitat. You should enlist the assistance of online sources, area nurseries as well as talk to those in your area who have had success in growing wonderful bee habitats. Keep in mind that bees are similar to humans in that they are drawn to beautiful colors as well as sweet smells. However different in that they thrive in wildly grown not so clean sometimes muddy environments. Regardless of your location, there is a process that will allow you to have the bee population you need that will enable you to enjoy a beautiful vegetable garden and its delicious benefits. It’s quite simple. If you give the bees what they need to lead a productive life, they’ll give your garden the pollination in return. Plant! Plant! Plant! Plant not only vegetables but a beautiful arrangement of color blasting flowers. These are bee rewarding plants in that they give bees exactly what they need. Bees are drawn to colors and purple, yellow, white and blue are there favorites. Bees with long tongues are attracted to plants in the mint family such as oregano and lavender. Talk with your local florist or nursery specialist about the best plants to grow in your area. You want to maximize your benefit by planting the widest variety conducive to your area. The flowers that grow best will produce and abundance of nectar and pollen. You should be careful to blend a variety of flowers together to produce a wide array of options for the bees to choose from. When possible, you should select flowers that will bloom a wide petal assortment similar to Daisies and California asters. Flowers with double petals don’t attract bees like single petals. Most double blossoms produce less pollen and nectar than single blossoms. The double petals also make it hard for the bees to access the inner flower. These are gorgeous to the human eye and all abuzz with bees. Be sure to plant some flowers in sunny areas because bees appear to be partial to sunny environments. Select flowers that require low maintenance whenever possible. This will prevent you from becoming overwhelmed with the tasks of growing your garden, caring for the plants and enticing the bees to have a long term visit. When attempting to lure bees to your garden, you must look at it as expecting guests. Just as you prepare for out of town guests, you must also prepare for the bees. You want to do all you can to make their stay as comfortable and rewarding as possible. If you’re planning on having them for an extended stay, you must be sure to prepare a space that they will enjoy and never want to leave. Not all bees live in hives and your bees may just need a place to live. Some of the females create tunnels in the naked earth and store the tunnels with pollen they have gathered and lay an egg. Some of the bees prefer cracks in dried wood or trees. Therefore be sparing with the use of landscape fabric and using too much mulch. Although the use of the above mentioned enhances the appearance of your lawn, it will deter the bees from your vegetable garden. Another part of learning how to attract bees is to always leave a space for wild growth near your garden. This is a space where grass and weeds are allowed to grow to full height. This provides a suitable habitat and shelter for bees. You can also design a bee house for the bees to live. To do this you can use several pieces of bamboo bundled together. Place the house close to the ground because bees prefer living close to the ground. An easier method may very well be to purchase a commercial bee house but that takes all of the fun out of it. A lack of proper places to nest is a major problem for certain bees. If you want to keep them around, you must provide the proper elements to create this atmosphere. Bees gather small pieces of leaves which they cut and transform into natal cells for their baby bees. Make tiny pieces of leaves from your garden easy for them to access in an effort to build their homes. They will show you their appreciation by the excessive pollination they’ll shower upon your plants and vegetables. Refrain from the use of pesticides and other chemical agents often used in gardens. Practice using natural substances to rid your garden of unwanted pesticides. Bees are negatively affected by commercial pesticides and the use of them would cause an adverse reaction to your attempt to attract them. Pollinators are not as active after dark. Therefore, if you choose to spray your plants, you should do so at this time. It would also be best to spray only after the vegetable has outgrown its flower. Read the labels carefully and if there is an indication that they are particularly harmful to bees, you should choose a different product. Mixing pesticides presents a danger to yourself as well as the bees. Please only use recommended mixtures in their correct quantities as a precaution. Consider using only organic forms of pesticides in your garden as well. Spiders and lady bugs are also great natural insect repellents. These two creatures find pleasure in indulging in the insects that tend to feast off of your garden. There are a wide range of herbs that bees are particularly attracted to. Basil, hyssop and borage are common and easy to find and bees adore these. English lavender, marjoram and rosemary are a few others that attract bees. Thyme is also an herb that attracts bees but be sure to only use these in combination with native plants. Again if you’re not certain which plants are native in your area, seek the help of a plant professional or nursery worker. Always leave bare patches of earth uncovered as well. Herbs when used for flowering purposes also offer other benefits to your vegetable garden. They repel insects and offer medical value. Be sure to leave water around for them to quench their thirst. Bees don’t nest well in well kept lawns. Allow the shrubbery and weeds to be a little more abundant than normal. Bees need a sufficient supply of nectar which supplies them with sugars for energy. This also gives the pollen as food and this is abundant in protein and fat. Be sure to plant bee attracting vegetables that produce at different times of each season. Doing so assures that there will always be a vegetable in your garden that gets the bees attention. Pumpkin and zucchini are great choices of vegetables for this and they add color enhancement to any vegetable garden. Wild garlic and peppers are tested and proven bee attractors. In addition to following the above steps, it’s always helpful to know some of the most common bee attractors and when possible line your garden and lawn area with them. Incorporating the above habits will provide a bee friendly atmosphere in your vegetable garden. Once the bees are there and active you will be in store for a garden rich in supply and fruitful in flavor. In essence there are thousands of different species of native bees in the United States. They are naturally not aggressive and usually don’t sting. Many of them don’t have hives. Carpenter Bees, Sweat Bees, Bumble Bees and Digger Bees are a few of the types you may have the honor of hosting. Following the above steps will give the bees a comfortable living environment and they’ll return the favor by generating the pollen your garden needs. Now you have it, how to attract bees! habitat, and I’m not sure we can really make a difference. any suggestions? No. I don’t have any suggestions. This article was written by a guest contributor so I really can’t add much. about yellow jackets…..The bury holes in the ground to next and as for many of us mowing our yards and mow over their holes…well you know the outcome of that. I did want to give all your readers a suggestions of how to get rid of yellow jackets. Cover their hole with the top of a glass cake plate or a glass trifle bowl for 1 week at SUNDOWN. Those who are late coming back to the next will get bored and move on. For the next seven mornings when the sun comes up…the yellow jackets are all abuzz-ed and flying around their glass container. Here is what actually happens. The glass confuses the yellow jackets that the sun is up and its ready to go get food and water….but they cannot get out. They get confused and spend all their energy trying to get out but cannot. Do not peek or open your glass enclosure for one week and you will be rid of the pesky yellow jackets and you can cover back up their hole and you can now rest easy. We have watering bowls for the bees all over our farm. I mix a little bit of sugar in the water to attract them and let them know where the water is. This helps the bees from flying long distances to get water. However don’t plant vegetables like chillies and green peppers as they cross pollinate and the chillies is peppers and the peppers is chillies. mike thanks for the info. I have a problem with my grape fine it looks like it is dying the drapes never did reach normal size this year could you tell me what is wrong with it. it is a concord grape. we have had oodles of rain this year could that be the problem. The Univ. of Minnesota Extension Service has a great website on Honey Bees. Everything you wanted to know about HoneyBees, Beekeeping & all. Even an online course on Healthy Bees. And “free-bees”. has a bee research program. Thankyou so much Mike for those information on attracting bees.my house is surrounded by so many different flowers that attracts bees and Iam thankful for you because most of the time we try to chase these bees away because we get scared of being stung by so many of them in the backyard.Now you have made me realise that,my garden is always productive because of these little insects,,thankyou bees and thankyou Mike. Until recently I kept 2 beehives. Even though I gave the hives to a friend, and he lives five miles away, the bees still come to visit. The number one herb to attract them is lemon balm- Melissa officinalis, Melissa is Greek for bee. If you plant lemon balm, and allow it to flower, you’ll have several happy bees flocking around the pale yellow flowers. Often, new bee keepers will rub lemon balm leaves on the hives to encourage the bees to return to the hives. Just bruise the leaves between your fingers and lightly rub on the outside. The bees will pick up the scent. Bees need water as well as food. So place several shallow saucers around the flower and vegetable garden. Change the water daily. A favorite food of the bees is a ripe banana. Let them get really ripe, peel them, and smear the ripe bananas on a tree trunk. The bees will flock to them and enjoy the readily available sugars and potassium. Sure, the ants will come and so will the woodpeckers and bluebirds to eat the ants. Nature is always in harmony. Mike, I have 2 mason bee hives in my yard one I ordered from a company and the other my husband made. I have alot of bees that come to me and I am proud to have them. The mason bees do not sting and do not produce honey but are great pollinators, You got me wondering if I put my houses up too high since you said they like it close to the ground. I’ll be looking that up for sure but last time we checked we had one occupant which was quite thrilling. Thanks for posting about bees and yes the bees need our help asap. Thank you, Margie in Reno N.V. I did mot plan for bees but have several herbs that are blooming right now, and the bees are all over them. One is lemon-mint and the other oregano. I’ll let the peppermint bloom, too and see what will happen. Besides bees I have bumble bees in several varieties, they con’t only love the herbs but the nasturtium, too. This morning we had a black and a yellow swallowtail in the yard. Love to see those, too. A,Bee,C … where have they gone? We used to have a plentiful number of bees but no more; there was also a bee keeper about an 1/8 mile up the road but no more. I’m sending your article along with many of the responses to my printer because, while I have so many of what you mentioned in terms of fruits-berries-herbs, I’m also experiencing so many unpollinated flowers wilting on my pumpkins, etc. Even with your first posting on bees this year, a couple of months ago, I never thought of buying a beehive but just reading the reply from ‘Bob’ above has put that thought into my mind … so long as it’s not a time consuming kind of thing. The ‘time consuming’ really caught me by surprise this year with the aforementioned herbs, berries, etc. not to mention propagation. Weeds like crabgrass and insect pests like catapillars (I was so busy looking for Japanese Beetles I OVERLOOKED catapillars) take a lot of time to control. they are so vital to what I love and their decline is becoming increasingly alarming. In my recent observances I have noticed the bees love the patches of clover in the field and I made a low maintenance flower bed and added very hardy flowers, the bees accumulate there in the masses.I added : asclepias,zinnias,mealy cup sage,bachelor’s buttons,black eyed susans and moon flowers, with morning glories.We have left dead trees on our property as we love the wildlife that seem to find it a safe haven. I keep trying to find the balance without having to use too many insecticides. I added a frog pond to my yard. I wasn’t quite finished with it when a toad decided it was a wonderful place to raise a family. these baby toads will help me get rid of the excess insects, the dragonflies have arrived and they will keep down the mosquitoes. I love the harmony in nature. I love reading your articles Mike…Keep up the good work. Although most people shriek when confronted with a bee, I try to accept them. They don’t bother me and I don’t fret about them. In fact, at the end of my driveway is an old hickory tree w/ an open area that swarms with bees. Yes, an active beehive is inside. I’ve seen about 5 swarms leave over the last couple of years. As long as they don’t attempt to swarm into my house, I let them be. In my veggie garden I have added gladiolas which I plant in succession. I will plant about 20 every two weeks starting in mid-May and continue up until the end of June, about 3 or 4 plantings. That will give me flowers to harvest AND it gives me blooms in the garden to attract bees to the veggie area. I have honeysuckle, sweet slyssum, roses, hollyhocks, lilies, petunias, clematis, hibiscus, daisies, and other assorted flowers throughout my landscape, too. Maybe I should consider a beehive – I mean, I love honey! I loved the bee article too, and want to look into buying or making a few hives for my yard. I too already have many of the plants listed in my yard, as well as a thriving vegetable garden, and blueberries, strawberries, raspberries, plum, apple and peach trees. Hi Mike, In the herbals, Monarda was known as Bee Plant, a kind of mint with pretty shaggy flowers It is drought tolerant, and works well with wild flowers. Another good old fashioned bee magnet is Scarlet Runner Bean. I read somewhere that killer bees were cross-breeding with domestic bees, producing a hardy “tame” species. Have you heard anything of this? 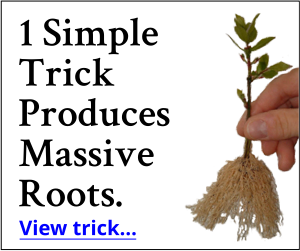 I’ve just discovered your site and am excited about trying the propagation method. I have set up a few containers with cuttings per your directions, but I’m not sure how long it takes for cuttings to root? I would guess it depends upon the plant……but is there a rule of thumb about when to check for rooting? Thanks. I’ve had great luck bringing bees to my garden with catmint. The front is border with the plant and the bees are constant all day long. I somehow attracted hornets. I have tomatoes, cucumbers,zucchini, green beans, and peppers. 30′ by 15′. I found the holes but don’t think I got them. Oh I also have two sets of Marigolds. These are not friends I wish to attract. Are they? Kelli mentions attracting hornets. In my experience most people don’t know the difference between hornets and wasps. Hornets are fatter than wasps and black with white markings. They make hanging gray ball nests consisting of layers of paper like material. Wasps are the common yellow jacket, skinny body with yellow and black or brown stripes. Neither of these insects stings but both do bite. Hornets can be very aggressive when disturbed and are not to be trifled with. Wasps on the other hand are annoying. Most people are not aware that wasps are also a pollinator. We live in farming and dairy country on a wooded hill. I actually have to continually remove native plants that sprout up. In particular, catnip and aster that are major pollinator attractors. Hi. This is in response to Laurel’s postings. I am by no means an entomologist but WHAT…..HORNETS & WASPS DON’T STING, THEY BITE!!!??? Apparently, she has never been attacked, they DO STING with the sword-like appendage coming from their rear end. The STINGER works like a hypodermic needle injecting venom into the skin. That is how they kill their prey, other insects, birds, small animals and PEOPLE who are allergic. In my own personal experience, I have been STUNG, not bitten, by bees, wasps and hornets. The bee was my own fault, I stepped on him in the grass, on my way to the pool. The bee died of course, as bees can only sting once in their lifetime. I was attacked by STINGING wasps when, I walked too close to their nest. I meant no harm but apparently, they felt threatened. Without any sort of provocation I was attacked by hornets when, I was quietly standing at the edge of an in-ground pool, in the middle of a concrete-type environment, on a rainy day. A trio of hornets came out of nowhere and started STINGING me between my shoulder blades. Not being able to reach them to knock them off, I jumped into the pool where they continued to sting me. It took a stranger, who saw what was happening, to jump into the pool after me, to pull the hornets off. As I am allergic, the last two scenarios ended in ambulance rides to the hospital. Although Laurel’s postings were meant to be helpful, they are inaccurate and therefore, can be detrimental to those who believe she is an authoritative person on this subject. People, please be careful with your internet postings. We have a fairly large vegetable garden, in town, in Fayetteville, Arkansas. We’ve always planted marigolds near our tomato plants. Not only do they bring in the bees, but I’ve heard they are a natural deterrent to tomato hornworms. As our tomatoes are always worm-free, I’m guessing that it’s true. We’ve planted some herbs this year, for the first time, and I have noticed an increase in the bee population. Always looking forward to your interesting articles Mike! Thank you! I’m very hesitant about attracting bees in quantity, as when living in Arizona I had a 60′ x 40′ vegetable garden surrounded by numerous flowers, including an adjacent rose garden. We ended up with a huge colony of killer bees just outside our back door, confirmed by the fire department and an entomologist. Now that I’m in SE Oklahoma, right off Lake Eufaula, I’m concerned about killer bee migration as just a couple of weeks ago there was an attack in NE Texas, not that far from us. I do have many of the flowers you mention surrounding us in neighboring yards, as well as some in my yards around my vegetable gardens. Have seen very few bees, perhaps due to the numerous natural predators, yet pollination doesn’t seem to be a problem. All of my plants are doing quite well with production. Have been harvesting cucumber, zucchini, strawberries, blackberries, beans, peas, radishes, cilantro, potatoes, Table Queen squash, and asparagus so far, but have lost my tomatoes and all 4 lettuce varieties to white flies, black spot, and probably the heat. My watermelon, cantaloupe, and honey dew are doing great, expect to start harvesting some of them in the next few weeks, and probably the eggplant as well. The Africanized Honeybee can only live in warmer climates, so it becoming a problem in the entire US is not likely. Also, if you have a colony of Africanized bees, all you have to do is replace the Queen. The hive takes on the genetics of the Queen. It’s great to have you aboard and anytime you have something to share about bees we’d be delighted to hear from you! I too am a Beekeeper and do presentations at schools, garden clubs, etc. I recently did a presentation at a local Whole Foods Market and one at a local State Park. The more we inform the public of our bee situation, the better. And I always encourage people to think about being a beekeeper. Thanks to all of you for your hard work. You keep us smiling and learning. If you want bees in your garden PLANT BASIL!!! My garden is full of bees because of the basil. The little bees are crazy about it! It is a real pleasure to watch them day by day in the garden. I have a lot of flowers, vegetable and herbs but for them the basil remains their main attraction. Hi, Mike, am so glad you posted this article. Some other important information to pass on: in regard to herbs, bee balm and lemon balm are also great for encouraging bees. I let all my herbs flower and go to seed, just to encourage pollinators. Another important point – bees cannot make good honey from azaleas or any member of the rhododendron family. Just a thought. Ok, thanks for all your hard work! You wrote or passed on this thought —-Bees Need a Place to Live—- and you wrote “An easier method may very well be to purchase a commercial bee house but that takes all of the fun out of it. Did you really mean that? I have been doing bee for 47 years and the fun is having a commercial bee house / HIVE! Opening a hive up, seeing inside and managing the bees so that they can produce 50 to 100 pounds of honey during the summer is as peacefully as going fishing. You do have a sweet tooth? When I go out to the hives I wear little more than a short sleeve shirt, pants, shoe and socks. A veil is not needed… as long as you use smoke…. from the smoker. Just be cool around the bees, there is nothing to fear. (they can sense fear) Mike, go find a local beekeeper… have him take you deep into a hive; listen to the buzzing and smell the honey. Watch how the bees fly into and out of the hive. Hold a deep frame of honey / brood, taste the honey and pollen inside the hive. See how the young brood that the bees take care of grows into worker bees. Watch how they move around in the hive and if you are lucky you can spot the Queen. A true gardener will have bees for the plants they raise. Without the pollinator of our world (Honey Bees) mankind future is limited. Albert Einstein once said: “If the bee disappears from the surface of the earth, man would have no more than four years to live. No more bees, no more pollination … no more men!” Bees / the world needs people like you… never too late to get into the buzz. Thank you very much for this article. I have been blessed with the best garden I have ever had this year and have also worked harder than ever before. I give God all of the credit because without Him we would not get anything. I have, totally by accident, planted a lot of the plants that bees love and, like you say, they have repaid me many times over. Thanks and keep up the good work. I look forward to your emails. Your lead photo is of honeybees yet you talk about all other bees. For pesticides, do not use sevin dust as the same electrical charge that attracts pollen to the hair on honeybees also gathers sevin dust. When taken back to the hive and fed to the larva, it kills the larva. Invite a beekeeper to place a hive or two on your property or learn to manage your own hive. Honeybees are very interesting and fun to raise. I have 14 hives! I to am a beekeeper. They are wonderful little creatures. Since getting our hives, other pollinators have shown up. We have more bumble bees, native bees and butterflies. It is work, but well worth the time. Marilynn, honeybees are covered with fur, wasps, hornets, yellow jackets are covered with hair. Yes your honeybees will pick up the sevin dust and carry it back to the hive. If someone does not want to start a hive of honeybees they should consider a colony of solitary mason bees. Even though they are basically a spring bee they do a great job of pollinating your spring crops. Also consider increasing your bumblebee population. If there is a flower blooming a bumblebee will be on it like stink on a skunk. What? You can do that? Now that it’s the middle of August, is this too late? OOOps, I pushed the submit button too fast. I forgot to add a thank you to the end of my last post. So if you decide to consider my post, please add a thank you to the end. I am a subscriber and loved the article about bees. I was wondering if sometime you could differentiate between a good bee vs a hornet, wasp or yellow jacket. We have bees, hornets, wasps or yellow jackets living under our deck boards. My husband thinks they are of the “unwanted” kind and wants to eliminate them but I don’t. So the question is how do we tell? If they weren’t living in an area they we use so often, they would definitely not be a problem. Right now they are close to our patio table and love to eat dinner with us. Yellow Jackets are a problem this time of year. They have a distinctive yellow and black striped thorax, and are much longer and skinnier than honeybees. When they set down on a deck rail or tabletop they have a distinctive “winking” habit. They are attracted to the smell of meat. Go to Lowes and get a couple of yellow plastic hornet traps and put a small piece of hamburger in each. If they are wasps, you will catch them without using poison. Spring is when yellow jackets (wasps) are building their nests (a disk-like structure constructed of tiny cells suspended by a narrow neck). Each cell is filled with other insects or spiders then a single egg is laid and the cell sealed. Because these nests are pendulant the under side of flat surfaces such as garden carts, tables, decks etc are attractive to wasps in spring. Because wasps are also pollinators killing them should be avoided if possible. The alternative is to knock the nests down with a stick long enough to be able to stay back. Once the nest is knocked down get away as quickly as possible. The wasps will feel threatened and attack by biting. After knocking the nest down stay away from the area. The wasps seem to search for the nest. After awhile the wasps will quiet down and gradually move away. They may attempt to build a new nest in the same area, in which case you need to knock it down the sooner the better. You just need to be persistant and they will nest somewhere that you find acceptable.